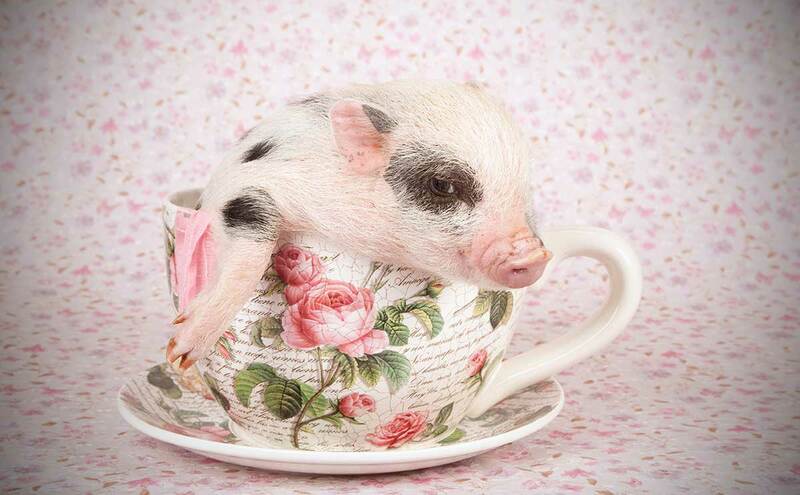 Thinking about buying a teacup pig? Just know that it won't fit in a teacup (or your house) for very long. As owners realize that they now have a hulking pig in their home (which, despite promises from breeders, are incredibly hard to housetrain), they are forced to give the pigs up. Which is where rescue operations like Crystal Kim-Han and her organization Vegas Pig Pets step in. Kim-Han takes in pigs that owners can inevitably no longer keep, and tries to find new homes for them. On the opposite end, some owners find themselves unable to stop feeding their pigs. “They will eat as much as you feed them,” says Kim-Han. “For these teacups pigs that weren’t being starved, they were growing and growing, outgrowing their houses, and then being given to rescues and sanctuaries.” Whether from over or underfeeding, Kim-Han says she regularly sees pigs suffering from owners who don’t know enough and breeders who don’t bother to educate. Like Hilton, some teacup pig buyers are taken in by websites that claim teacup pigs will be as small as 12 pounds. One site promises to sell potential buyers “Super Micro Nano Teacup Pig~ 12 LBS and up (very rare).” The problem, says Kim-Han, is that that’s impossible to guarantee a pig that small. “Yes, there are a few pigs that are in the fifty to seventy pound range that aren’t starved,” she says, “but they’re far and few between. We almost never see them.” More typical is a pig that grows to around 100 pounds. “A really big dog, that’s about as small as you can hope for,” say Dr. Khuly. “It speaks to the issue of domestication,” says Dr. Khuly. “We domesticated dogs and cats primarily for companionship.” It’s an ancient relationship — domesticated dogs stretch back 15,000 years and cats for at least 9,500 years. Pigs, meanwhile, are different. “At no point in the history of pig domestication was the pig ever considered a pet. There’s a lot to be said for how humans have historically interacted with these animals.” In other words, it’s hard to suddenly change the behavior of something we’ve bred for dinner for thousands of years into something we can pal around with. While both Kim-Han and Dr. Khuly emphasize that pigs can make great companions, they’ll have special needs. They’ll grow larger than most family pets — even a miniature potbellied pig will likely outweigh an average person by the time it’s done growing. Outdoor space is a must, and Kim-Han recommends that potential pet pig owners adopt at least two pigs, as they’re herd animals. Pigs (especially males) should be fixed, and you’ll likely need to find a speciality vet to do so. If, at the end of this, you still feel like you’ve got a penchant for a pet pig, there’s one final bit of advice: adopt. Groups like Kim-Han’s Vegas Pet Pigs exist across the country. Pigs are incredibly prodigious breeders, and rescue shelters and sanctuaries are often overwhelmed. Just be aware that whatever you adopt, it’ll never fit inside a teacup. I recently purchased a miniature pot bellied pig. My expectations were low as I have had no experience raising pigs as a pet. Unfortunately you lost my trust and credibility as an educational resource with your remark that pigs are,’incredibly hard to house train.’ Our pig is 2 months old and goes to the bathroom in a litter box filled with pine shavings. It was surprisingly easy-much easier than a puppy. My daughter wants a pig… I’m glad I read this blog before we ran out to get one. Her pig desire will have to wait until we move on to a larger property where we can keep the pig once it gets larger. Thank you for providing the information about future care. I totally didn’t think about that and now need to know how long a domesticated pigs lives. Kind of like when my children wanted a tortoise. Do you ship across country? ?